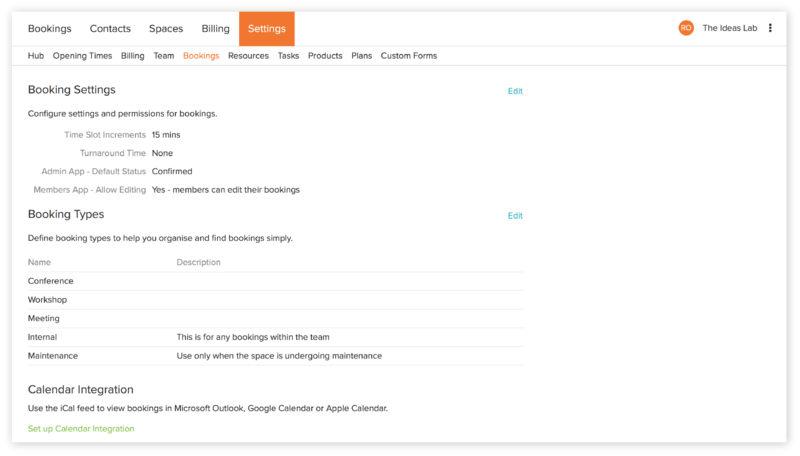 Configure your booking settings to make managing bookings simple from the outset. There are a few different, and important, areas to booking settings. Once you've configured these, it's unlikely you'll need to return there unless you make some major changes to your space! These are your settings for default statuses and permissions for making changes to bookings. Time Slot Increments: Time slot increments affect the increments that any users using the Members App can book in. If you set 15 min increments then anyone using the app will be able to make a booking in increments of 15 mins. If you only allow 1 hour bookings as a minimum, you'd set it to 60 mins, and so on. Turnaround Time: Setting a turnaround time creates a buffer for any booking to allow you time to set up a meeting room beforehand and to pack down after the booking. The contacts who made the booking isn't charged for the set up/pack down time, and other contacts can't book the space in a turnaround time. Admin App - Default Status: When you or a member of your team is making a booking your can set the default status as confirmed or unconfirmed. A confirmed booking prevents members or external space users from making bookings but admins can still make overlapping or conflicting bookings. Confirmed bookings appear as blue bookings in the day view calendar. An unconfirmed booking is a tentative booking, much like a pencilled in booking. They appear as dark grey in the day view. It's important to be aware that while a booking has an unconfirmed status, members and other space users can make bookings in the same time slot. Members App - Allow Editing: This set the ability for any invited contact to the Members App to either be able to edit a booking that they have made. Or not if you set it to 'No - Bookings can't be edited by members'. This only enables editing a time, date, resources, description and so on. It does not allow a member to cancel a booking. To do this, they have to contact an admin. Once Habu allows you to set your cancellation policy, members will be able to cancel bookings, depending on your settings. Booking types can be a useful way to both organize and add further detail to bookings. If you've added a booking type to a booking, it will appear after a booking title if one has been set. If a booking title hasn't been set then, then the booking type will appear first. If no booking title is set, the booking will simply say 'Booking' followed by the contact name.